Selena Flood is a fighter with preternatural talent. But not even her quick fists and nimble feet could save her parents from the forces of New Canaan, the most ruthless and powerful of the despotic kingdoms populating America-That-Was. Forced to flee the tyrannical state with her younger brother Simon in tow, Selena is now the last chance for peace in a continent on the verge of complete destruction. In her pocket is a data stick, the contents of which cost her parents their lives. Selena must now ensure it reaches the Republic of California—a lone beacon of liberty shining across a vast and barren wasteland—before it’s too late. 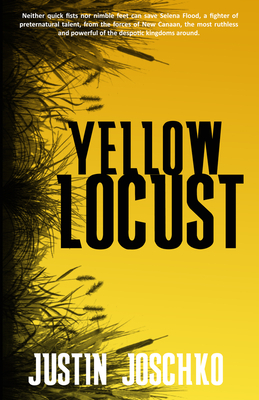 Between New Canaan and California stretch the Middle Wastes: thousands of desolate miles home to murderers, thieves, and a virulent strain of grass called yellow locust that has made growing food all but impossible. So, when Selena and Simon stagger into Fallowfield, an oasis of prosperity amidst the poisoned plains, everything seems too good to be true—including the warm welcome they receive from the town’s leader, a peculiar man known only as The Mayor. As Selena delves deeper into the sinister secrets of this seemingly harmless refuge, she soon learns there is a much darker side to Fallowfield and the man who runs it. Before long, she must call upon the skills she honed in the fighting pits of New Canaan to ensure not only her own survival, but that of her brother, in whom the Mayor has taken far too keen an interest. And she’d better act fast, for an all-out war inches ever closer, and New Canaan is never as far away as it seems.